Posted 12:51 PM by balanceatx.com & filed under Uncategorized. But as often as we make our resolutions, something derails our plans and we’re right back to where we started, sometimes even before January is over (today is January 2nd – how are you doing so far? ;-)). But why is that? Why is it so hard to stick with a resolution that is meant to make us healthier / more productive / happier? Often the reason we fail to stick with our resolutions is because we are not creating them and framing them in a way that lines up with how our brains work best. 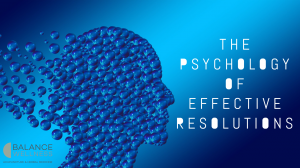 The forward-thinking/planning part of the brain that we often use to make our resolutions is easily overruled by the deeper, older parts of the brain – the parts of the brain that are responsible for your emotions and your instincts and to a large extent control what actions you take. Fortunately, we can use what we know about basic human psychology to our advantage when making our goals and resolutions. If we make our goals in specific ways, we give ourselves a much higher likelihood of sticking with them and building off of our success. Make your goals SMART. SMART is an acronym for Specific, Measurable, Actionable, Realistic and Time-bound. We’ll use weight loss as an example because it is relatively simple, but you can use the acronym to formulate any goal. Time-bound – I will lose the weight by March 31st. If you can follow this combination of criteria for making your goal/resolution, you will set yourself up for success by benefitting from the reward system in your brain, which is essentially a burst of dopamine as you accomplish your goals. Because your SMART goals will be realistic and you will know when they are done (specific), you will get a dopamine surge when you accomplish each goal, and your brain will WANT to make another goal so it can get another dopamine hit. Determine your “why”. Before you determine “what” your specific goal will be, you need to determine your “why.” Using weight loss again as an example, why do you want to lose weight? Is it to be able to keep up with your kids? To be able to run a 10k? To avoid chronic diseases and live longer? What is YOUR motivating factor? Determining your motivating factor is essential to help keep you on track when your goal gets tough. Because it will get tough. You need to be clear with yourself about why you want to accomplish your goal. In psychology, this can help you tap into your limbic system, which is your primal system for controlling emotions. The limbic structures are very deep in the brain and tend to have a hand in controlling a lot of our actions, whether we are aware of it or not. So use this to your advantage: How would losing weight make you feel? How would it change your life? If you can feel that emotion and connect it to your goal, you will use this part of your brain to your benefit. Be kind to yourself. In the right circumstances, the brain can be convinced of just about anything. So whether you tell yourself you can do something or your can’t do something, you are probably right. If you start your day, everyday telling yourself that you will accomplish your goals and you have everything you need to make it happen, then you have a much higher likelihood of making that a reality. Most resolutions and goals fail because they are not made in ways that take our understanding of our own psychology into account. Make your next goal SMART, determine your “why” and be nice & positive with yourself to greatly improve your likelihood for success!